We return to one of the best races in the whole year. The white roads are calling. We have the exact same route as last year, a perfect mix of everything I love to see in a bike race. 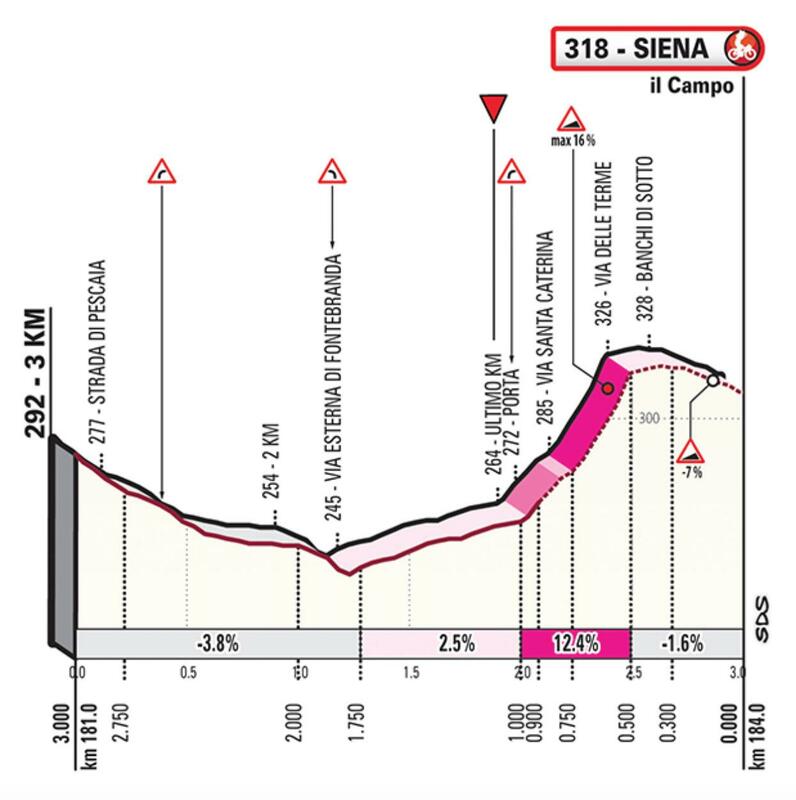 Sector 8 Monte Sante Maria – at 11.5km, it’s the longest sector in the race and the hardest one. It has some steep sections, but also some tricky descending. This is usually the point in the race when we see some big moves. We then have a long section on the main road, this can see some groups coming back together, before we start the finale of the race. Sector 9 Monteaperti – not in the picture, it’s only 700m but is brutally steep, don’t underestimate it. We’ve seen moves go here before. 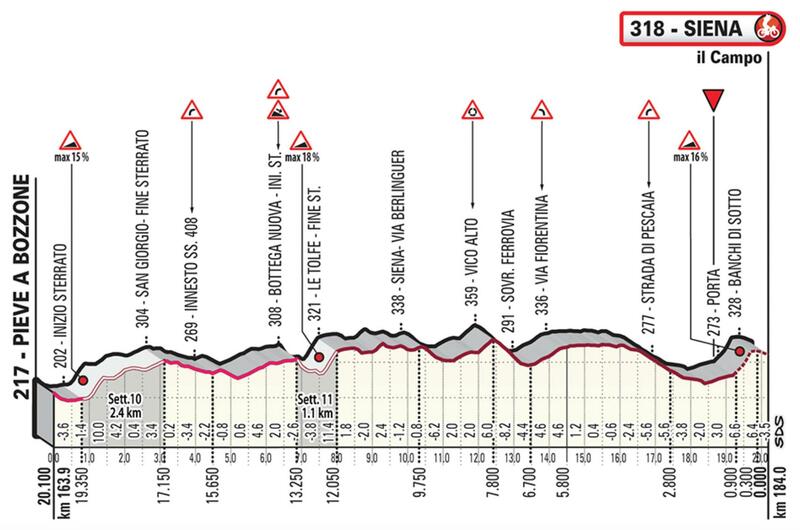 Sector 10 Colle Pinzuto – this is where Benoot made his big move in 2018. It is 2.4km long and kicks up to 10% for over 500m. Sector 11 Le Tolfee – here is the last chance to make a big move before the final kilometres. You descend into it, before some hellish gradients hit you hard. After a tough race, this short climb can really find you out. The ramp up to the finish is beautiful. We have the fans lining a narrow street, with a gutter running down the centre. With the crowds screaming encouragement, this is when we’ve seen the race decided on many occasions. Benoot was solo here last year, he got to enjoy the fans without any pressure. Will we see a battle on Piazza del Campo in 2019? Sunny intervals and a gentle breeze from the South-West. All week has been nice in Siena, we should get perfect conditions for this edition. The weather usually has a huge impact on this race. When we have good conditions, we normally see a large bunch together as we approach sector 9. 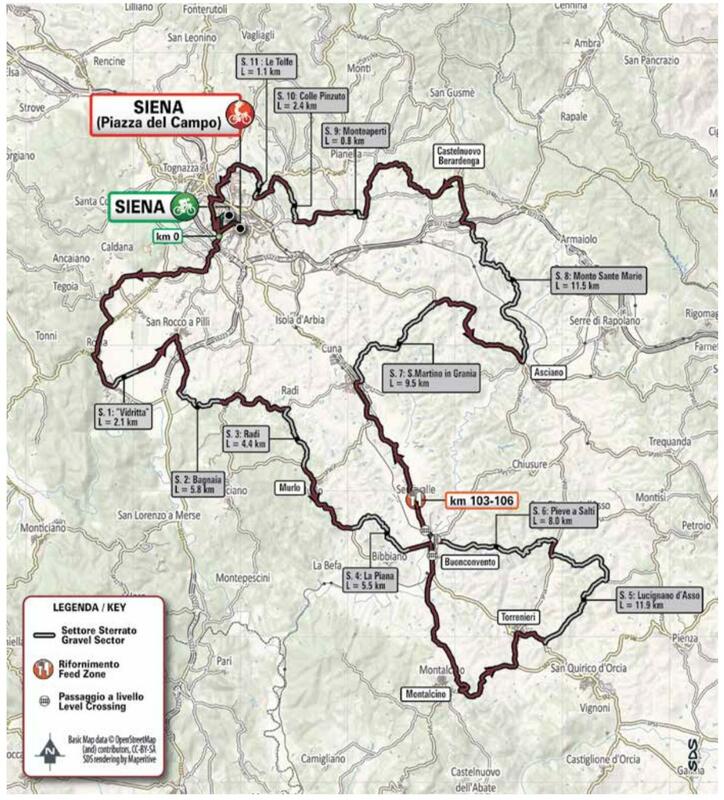 If this happens, it increases the chances of a group of around 5 riders being together as we head to Siena. Having multiple riders will obviously be a huge advantage, this is how Moreno Moser won back in 2013. Unlike the Belgian races, it is highly unlikely we’ll see a team have 3 or more riders in the finale. The climbs are so demanding that most domestiques cannot cope, making this a race between the big favourites. This is one of the reasons it is so special. Zdenek Štybar – was so impressive taking a brilliant win in Nieuwsblad, which followed an equally impressive win on Alto do Malhāo. It seems like he has eventually found the winning bug, something that he’s been desperately searching for. 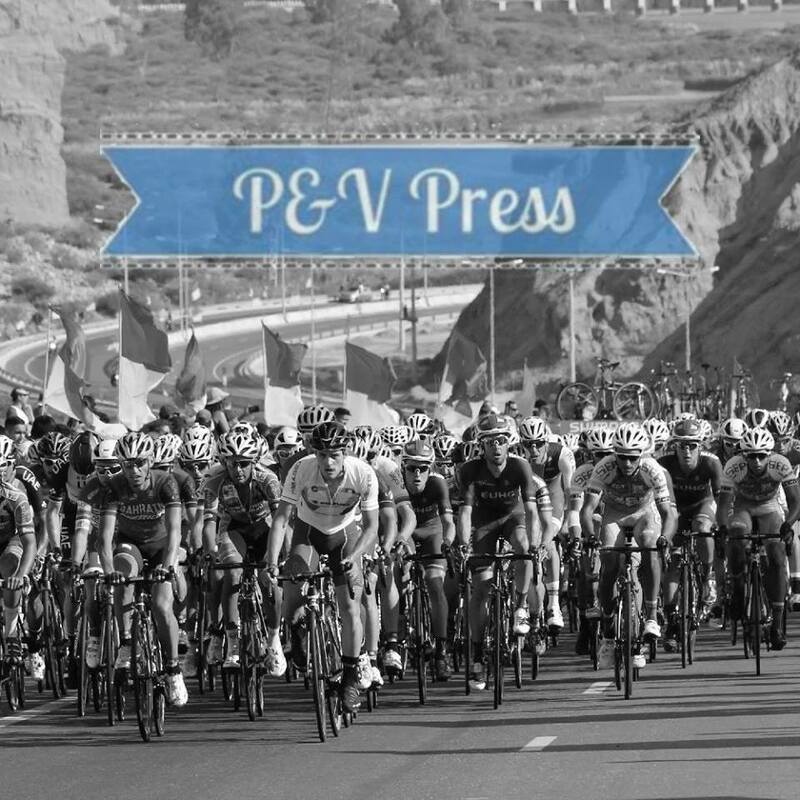 QuickStep arrive with two of the strongest riders in the peloton, that gives them a huge advantage over the rest of the field. The Czech star won here in 2015, beating Van Avermaet and Valverde on the Piazza del Campo, it’s a race that suits him very well. The white roads are no problem for the former cycle-cross superstar, and he starts the race as one of the big favourites. Julian Alaphilippe – not a bad plan B for QuickStep! The Frenchman arrives already with three wins this season, going to South America was a wise move. Interestingly, it’s the first time he’s raced here, he’s usually busy preparing for Paris-Nice. Winning this race on debut is a very difficult thing to do(Stybar did it), but can do it. Alaphilippe has developed into one of the best riders in the world, he really is a man to fear. His recon of the white roads will be important, he needs to quickly understand how to climb these roads. He and Štybar will form a tough partnership to beat. Jakob Fuglsang – the Dane has enjoyed a strong start to the season, culminating in his win in Ruta del Sol. He’s another who usually favours Paris-Nice, but he did ride here in 2016, where he managed to finish a respectable 11th. The former mountain biker will be very happy with the white roads, one of the reasons for him to return here and have another crack at the title. Astana have started the season very strongly, just like QuickStep, they start with two strong favourites. The problem for Fuglsang is the final kilometre, he doesn’t pack the same punch as many of his rivals. Alexey Lutsenko – the Kazakh champion has raced here in 2014, 2015 and 2018, but without threatening. He’s started the season like a house on fire, taking wins in Oman and going very close in Nieuwsblad. He will form a strong partnership with Fuglsang, but can either of them outsprint Štybar, Alaphilippe and Van Avermaet? Astana will need to think carefully about their tactics, it would be better to attack from distance. Greg Van Avermaet – the Belgian has had two 2nd place finishes here, he’ll be determined to eventually take home the crown. He looked very impressive in Nieuwsblad, but being the fastest finisher in the group led the others to try and lean on him. Despite not winning, he would have been delighted with his performance, it backed up his impressive start to 2019. This race is obviously much hillier than anything in Belgium, something that isn’t great news for his team, CCC look much better suited to Greg’s home roads. Being isolated won’t be a huge problem for him, he used to situations like this and has lots of experience which also helps. Tim Wellens – 3rd here in 2017, it is a race that suits him. Wellens is another who enjoyed his start to the season, he already has three wins to his name. He looked good in Nieuwsblad, but seemed to struggle a little on the climbs compared to GVA and Štybar, something he needs to fix in this race. If Benoot is fit, Lotto will also have two strong options to play, that will help them match up against QuickStep and Astana. Wellens has everything required to win this race. Tiesj Benoot – such a shame he crashed on Saturday. Before that point, Tiesj looked in fine form and never seemed in any trouble. He’s clearly not had ideal preparation for this race, something which could well go against him. This is the first time he has worn number 1 in a pro race, I really hope the injury doesn’t hold him back. If 100%, he’ll be fighting for the win. Daniel Oss – the Italian will have freedom to chase personal glory, as Sagan isn’t here. He was looking good on Saturday, but was distanced on the Muur. Oss is one of those loyal domestiques, who rarely gets a chance to chase personal glory, he would be a very popular winner of the race. Wout Van Aert – was very strong here in 2018, but just didn’t have the gas on Piazza del Campo. Saturday was his first road race of the season, his 13th place was quite respectable. I’m not sure he’ll be at the level required to challenge against the riders who have started 2019 in such fine form. Vincenzo Nibali – if this was a stage in the Giro, he would win. It’s not, so he won’t! So many strong riders, just like last weekend, picking a winner certainly won’t be easy. Looking back at Nieuwsblad, it was clear that Van Avermaet and Štybar were the strongest on the climbs, but Wellens wasn’t too far behind. Throw in Benoot and Alaphilippe and we have a battle royale. Astana will also want to be in the fight, especially as Lutsenko and Fuglsang are both in great form. Looking at the riders, the finale is perfect for Julian Alaphilippe and I think he’ll take the win. This is a strange race. Alaphillipe stands out as perfectly suited to the course but the riders who you expect it to suit dont always performa as expected. I still cant quite believe Valverde didnt win in 2015 on this finish against Stybar and GVA and if he didnt then just as shocking that Stybar managed to effectively outsprint him. If GVA is in the front group I cant see him making this mistake again but then again strange things happen here. Apparently Lombardia and Sanremo were stages of the Giro? I agree that Nibs won’t be winning this race, but don’t put it past him just because it’s not a Grand Tour. Hard to imagine Quick Step losing this. What do you think of Mohoric, Moscon, or Soren Kragh?